Us vs Them. Me vs You. Old vs Young. Rich vs Poor. We are feeling more divided than ever. Yet the path to brand relevance and resilience is recognizing what we have in common. 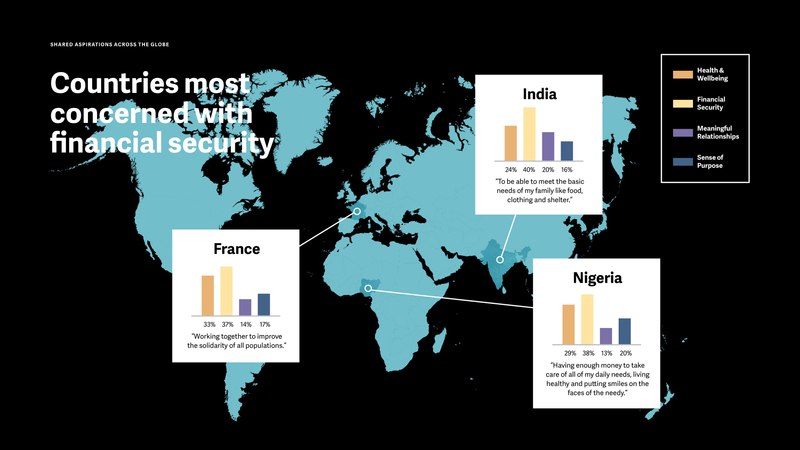 Recently we asked 16,000 people globally — across 16 countries, in many languages, in rural and urban areas — about their aspirations for their lives, families and communities. * While the dominant narrative in culture today is that we’re deeply divided — culturally, politically, economically — reading the answers from people across the globe we were reminded that we all share the same aspirations for health, wellbeing, financial security, meaningful relationships and a sense of purpose. Our research also revealed how our common human aspirations are being threatened by anxieties and systemic barriers that are affecting consumer priorities and transforming their expectations of and relationships with brands. Whether it is extreme poverty, income inequality, corruption, human rights abuses or the ever-increasing impacts of climate change on agriculture and coastal living, more consumers are making the connection between corporate actions, the quality of their lives and the success of their communities – providing new challenges and opportunities for brand leadership. As consumers try to meet their own needs and fulfill their hopes for the world around them, they are feeling less empowered to influence corporate behavior and more challenged in making their aspirations a reality. For the first time since 2009, more consumers say they have punished companies for their behavior (28%) rather than rewarded them (26%), and the number of those who are punishing brands is up by 9% since 2013. So, how can global brands lead in the context of these dynamic tensions to connect more deeply and authentically to consumers’ needs and desires? And how might understanding our anxieties and aspirations unlock more meaningful relationships, loyalty and participation? We have identified four design principles to help brands break through with consumers, drive business growth and leverage the speed and scale of the marketplace to advance a more creative, interconnected and participatory society where we all feel more joy, experience better health and enjoy more prosperity for everyone. A fundamental design principle in divided times is to start with empathy and listen to what people are feeling and what they desire for their lives. Brand relevance starts with a human truth that shines through in every business decision, product design and marketing program. To remain relevant in times of dynamic change, winning brands are honoring both the conflicts and the aspirations of consumers’ life experiences and are showing up in honest and authentic ways. Take for example Heineken’s recent ad “Worlds Apart.” Recognizing the deep ideological divides in our politics and culture, Heineken challenged conventions with a campaign based on the human truth that beneath the surface we are more alike than we are different. Brand purpose lives at the intersection of a company’s authentic reason for being and the unmet human needs that it can uniquely fulfill in the marketplace and the world. Revealing this harmonic is the key to defining your north star. DanoneWave, the U.S.’s largest public benefit corporation whose brands include Activia, Evian and Dannon yogurt, developed its Alimentation Revolution manifesto to bridge the disconnect between people and the source of their food. All of the brands in the DanoneWave portfolio are now becoming “manifesto brands,” whereby the products, positioning, communications and marketing will holistically support its north star purpose and be measured by the B Corporation impact assessment. More than ever before, consumers want brands to put a stake in the ground. It is not simply about reacting to today’s news cycle, but rather knowing where you stand and standing strong when issues arise. Amid a growing global refugee crisis, Starbucks is taking a stand by committing to employ 10,000 refugees over the next five years. Known for their long-standing history of creating job opportunities for all and investing in the people who are a part of the communities where they do business, the initiative not only helps address a serious global crisis, but it reinforces their reputation at the local community level. Marketing and CSR teams are joining forces to create consumer-facing platforms and campaigns that bring the brand’s voice, perspective and initiatives to the masses. To navigate today’s increasingly volatile political and cultural dynamics, it is essential to use your north star values as a touchstone to connect with consumers who are increasingly preoccupied with serious social and environmental challenges. Delivering on brand relevance also requires welcoming more and different voices to the table, using our collective wisdom to solve problems together and rallying consumers and employees to take action with us as brands. 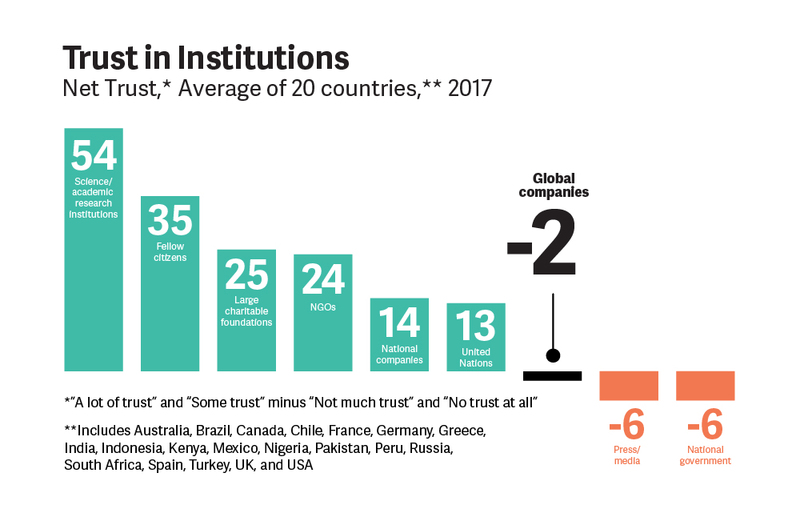 When net trust in global corporations is less than zero, it is understandable that brands may feel overwhelmed and afraid to go it alone. That is why thoughtful partnerships can empower brands to tackle meaningful issues without feeling like they are straining credibility or speaking out of turn. Ben & Jerry’s is rallying its customers in partnership with the online activism platform Avaaz to raise awareness and demand climate action by engaging our global leaders. They’re doing this through a very simple bit of logic: If it’s melted, it’s ruined. It’s true for ice cream, and it’s true for the planet.Partnerships with climate action organizations 350.org, The Climate Reality Project and BICEP have added more depth to the campaign while Ben & Jerry’s lovable brand and extensive reach have helped amplify the cause. They’ve even taken the message to the freezer aisle where their “Save Our Swirled” ice cream flavor puts the climate action message right on the package. It doesn’t hurt that it’s delivered deliciously with raspberries, marshmallows and fudge, too. Starting a movement can be especially impactful when brands join forces and invite participation by their peers and competitors in the interest of making positive change for society. Brands are built by humans, and brands are built for humans – based on our common needs, anxieties, aspirations and desires. We all feel the same pain, and we all want the same things. The challenges we face are more urgent and interconnected than ever. Now is the moment for corporations to help solve these challenges by designing with humanity at the center. Brands that do so will remain resilient, earn the loyalty of consumers and lead the way to a new future where businesses, individuals and society thrive together.